The Mission is located in Bend, Oregon, 3 hours southeast of Portland and 2.5 hours east of Eugene. Take I-84 east to exit 16. Follow 238th Drive south to connection with US 26. Take US 26 east 103 miles to Madras, OR. Continue south on US 97 40 miles to Bend. Take exit 137. At light turn left onto Revere Avenue. At next light turn left onto Division Street. Church is 1/2 block on right in the Whistle Stop Business Center. Take US 126 east 98 miles to connection with US 20. Continue east on US 20 21 miles to Bend. Take exit 137. At light turn left onto Revere Avenue. At next light turn left onto Division Street. Church is 1/2 block on right in the Whistle Stop Business Center. Take US 97 North to Bend. Take exit 137. At light go straight 1/2 block on Division Street. Church is on right in Whistle Stop Business Center. 8:30 AM Matins; 10:00 AM Divine Liturgy. Confessions are heard following Vespers, one hour before Liturgy, or at other times by appointment. Please visit the parish website or call 541-668-7682 for a schedule of services for weekday Feasts, Lenten services, Holy Week, etc., as well as for classes and activities. Bend is a historic town, located on the Deschutes River; one of the places where the Oregon ranching and the lumber industry was born. In the last 20 years especially, Central Oregon has become one of the country’s most desirable places to live. In the shadow of Mt. Bachelor and the Three Sisters mountains, Bend has a unique blend of outdoor activities for all four seasons and a wholesome environment for raising families. Many churches have been planted and closed, due to the revolving door of new versions of Christian Protestant expression. 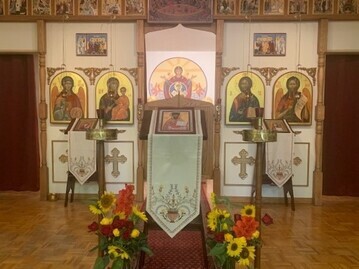 In contrast, Orthodox Christianity has been virtually unknown in Central Oregon, a place that is the third fasted growing county in America, so the need has been great. More than a dozen years ago Archpriest Stephen Soot, with a handful of Orthodox Christians, began the work of establishing the only Orthodox Church within a 3 hour drive, in one of the most unchurched states in the country. The missionary endeavor bore fruit and St. Jacob of Alaska parish was officially established in 2009. As with many mission efforts, there have been ups and downs. On two occasions during its history, there have been priests in residence, but no long term continuity. Thanks be to the tireless efforts of Fr. Stephen Soot during this 12 year period, and the support of supply priests like Fr. Athanasius and his wife Mka. Molly, as well as Fr. James McKee and Mka. Kathy, the hope of a permanent church in Central Oregon has continued to grow. In September 2016, Fr. Damian Kuolt and his wife Mka. Joanna rented a home in Bend in order stay and serve as priest and pastor. As a community of believers, we are very happy that under their leadership we can provide weekly Divine Services, catechesis, inquirer classes, Bible study and outreach to those who are seeking the Truth.